In the first two installments, we covered Insulation & Investment. Today I finish the series with Influence. 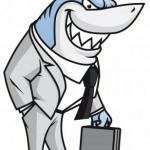 As you remember, a ” Shark” is what I call the kind of producer you don’t want anywhere near your clients. Sharks are consummate hunters, true production machines and experts at breaking relationships. Influence is the act of leveraging people, positions and relationships to insulate your clients from the Sharks. Your best clients should feel special. They should feel a strong connection with you, your agency and your network. It is incumbent upon you to seek out opportunities to connect your best clients with influential members of your agency, your client base, your social network and your business network. The more connections your best clients have in common with you, the more secure they will be. Let me share some ideas for leveraging influence. Agency: Every large client should receive a call from your agency owner and manager to personally thank him or her for their business, and let them know how important they are to your agency. They should re-assure every large client that they are always available. Agency events: Large clients should always be invited to agency and Company events and should be introduced to staff, other clients and agency friends. Golf outings, seminars, company parties etc. Your best clients should know you and your agency personnel and feel connected to your company. These social events, mixers and education programs provide insight for your best clients on who you are and what you do. It endears them to you and provide opportunities for them to connect with your inner circle. Agency Clients: One of the strongest ways to insulate clients through influence is to introduce your clients to your clients. Open you book of business to your clients and ask them whom they would like to meet and then schedule golf, breakfast, lunch etc. and introduce clients to clients. COI’s: We all know influential people in our community. Be the conduit for introductions of clients to centers of influence. Perhaps we know captains of industry, athletes or other influential people. Make your best clients feel special by introducing them. Reverse influence: One of the very best ways to insulate your best clients is to get them to introduce you to their inner circle. Once you are introduced as “Their Agent” to their clients, their suppliers, their business partners, their friends, it becomes very difficult to break that relationship. Obviously a side benefit of getting introduced to your client’s circle is opportunities for business. Company: Larger, successful clients love to give tours and show of their business. Schedule to have company representatives visit your best clients. Especially marketing reps, company executives and underwriters. The more connected your large clients feel with their insurance company, the better off you will be. Service providers: Think through the business needs of your best clients and problems and challenges that your best clients might have. Be a source of information and introductions to service providers that can help them address needs and solve problems. One of my Agency clients schedules sales training for his best clients when I visit their agency. Yes, my client asks me to train their clients on sales, pipelines, prospecting and leveraging introductions. It’s actually very rewarding, is very well received and is something that none of his competition would ever think of doing. Their clients tell hem that it is a huge value added benefit. The point is, think out of the box and get creative with introducing people to your best clients. It is one of the 3 keys of protecting your best clients and fostering long-term relationships.